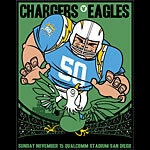 In the early 1960s, the fledgling American Football League, known as the AFL, used cartoon mascots for teams on the covers of their programs. 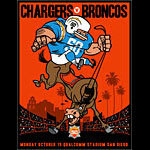 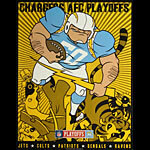 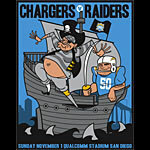 These 50th anniversary San Diego Chargers posters are a throwback to the legacy of the early days of the AFL. 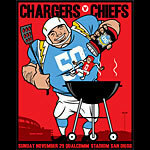 All of these posters were designed by San Diego's own Scrojo, one of the most prolific poster artists of the modern era.